Huntsville Hospital is the flagship institution of the HH Health System and is one of the largest not-for-profit community hospital systems in the nation. Huntsville Hospital’s footprint in Madison County is comprised of 971 licensed beds, including ten ICUs, numerous specialty services, and a state-of-the art Pharmacy Department. More than 200 Pharmacy team members provide medication-related services to a wide variety of patients in numerous settings. Huntsville Hospital offers four pharmacy residency programs: a PGY-1 program accepting six residents annually, a PGY-2 program in critical care accepting two residents annually, a new PGY-2 program in infectious diseases and a new PGY-2 program in oncology. The PGY-1 residency program was first accredited by ASHP in 1984 and has graduated more than 100 pharmacy practitioners. The PGY-2 critical care program accepted its inaugural class in 2010 and is fully accredited by ASHP. 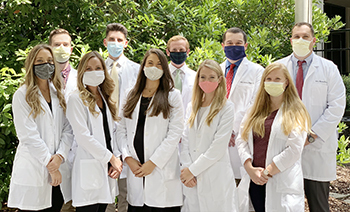 The PGY-2 infectious disease program is in candidate status while the PGY-2 oncology program has applied for ASHP pre-candidate status and plans to accept its first resident in the summer 2019. The programs allow the resident to pursue individual interests and goals. Wherever possible, practice experiences are continued throughout the year rather than in individual practice segments. While much learning takes place during the residency program, more emphasis is placed on "doing" - residents are given numerous opportunities to participate in drug therapy management and must take responsibility for patients' pharmaceutical care on a daily basis. The Huntsville Hospital Department of Pharmacy is committed to serving the drug therapy needs of patients and health care providers to assure: improvement in patient outcome and quality of life; rational and cost-effective pharmacotherapeutic decisions; efficient utilization of resources in structuring systems and services; safe use of medications. All applicants must be registered with the ASHP Residency Matching Service and materials must be submitted through PhORCAS. Please do not submit materials directly to the RPD. Once application materials have been reviewed, qualified candidates will be invited for an on-site interview.